Septic systems are one of the most trouble free sewage treatments available when no public sewer is available. They have an average lifespan of approximately 30 years if well maintained. However, they will eventually need repair and or replacement. Some tanks have an actual tee fitting which requires a cap be placed on the top of the tee to keep gases inside the tank. When this cap falls off or is removed odors can be smelled inside the house. Replacement of this cap usually stops this from happening. Both the line coming from the house and the one going to the leaching system are connected to the tank with what is call a “Tee Fitting”. Older types of tees were made of clay pipe, concrete, or Orangeburg pipe. All of these over time become brittle and break off. Newer plastic pipe fittings can still be broken off but do not have the issue of deterioration and becoming brittle. These fittings can be replaced and reconnected to the house or leach line. This work is done both from the outside as well as the inside of the tank. They are both important to the functioning of the system, the inlet tee to let the waste enter the tank at the correct level and not poured across the top of the scum mat. The outlet tee is the last and most important barrier to keep the solids inside the tank. Without it they free flow out into the leaching area and will eventually cause system failure. Deterioration is also the culprit for tank walls needing to be resurfaced. Keeping them smooth and strong is important. If the deterioration process is left to go on for too long, the structural integrity of the tank is compromised. Probably the most common repair is the tank top itself. As tanks age, the deterioration process is most obvious on the tank top. You may not see the damage readily due to the fact that it is occurring on the inside of the tank. When the tank was new, the top measured approximately 4″ thick. As time goes on the process accelerates and safety is a major concern. Without its strength, the tank can give way and collapse at any given moment. Even as much as a young child walking across the top may be enough to collapse it. It is for the obvious safety concerns involved that we try to catch each tank top before it gets to the point of being a safety issue and while repair is still an option. Once the tank has collapsed, you have to replace it. When we repair a tank top, the entire top of the tank must be uncovered, there is the option of having new standard tank lids installed or upgrading to tank risers. When a system is old or improperly maintained through the years or has been damaged beyond repair. The only way to proceed is by completely replacing the septic tank and or leach field. This is the most costly type of repair. It can only be done if there is enough space left on the property (Reserve Area). In order to make a new installation, permits must be obtained by the county, and landscaping is usually destroyed in the process. It is generally considered a large scale repair. Heavy equipment is necessary. This type of a repair requires it be done by a licensed contractor with either an “A” or a “C42” Connecticut State Contractors License. Our company can also handle this type of repair. In some instances, where there is sewer available, the idea of septic is abandoned all together and the home is connected into the city sewer. 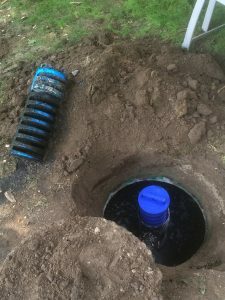 When roots are allowed to enter the septic tank or any of the system components, they either clog or block lines, create a root mat inside the tank or in severe cases cause system failure. In the case of a root invasion inside the tank, if chemical treatment is not an option, they have to be physically removed. This requires several men and quite a few hours of labor to complete the job. In the case of a root invasion inside the tank, if chemical treatment is not an option, they have to be physically removed. This requires several men and quite a few hours of labor to complete the job. When roots enter a crossover pipe or a tight line pipe, we recommend that the entire pipe be replaced to avoid chasing the problem around and eventually replacing the pipe anyway. This way you know there is a solid connection at both ends and you know the pipe is in good condition all the way through. When roots have entered the actual leach lines and invaded the soil or rock around the pipe, there is little that can be done to treat or remove them. We have seen many attempts to repair or snake the roots away to no avail. Unfortunately, new leach lines may need to be added.